I was super excited for this week’s project- hanging curtains in the living room. It’s something I’ve been wanting to get done for a while. First I had to commit to the curtains, then, when I bought them and a curtain rod at Ikea, the rod was too short. What’s that you say? Measure before you go shopping? Now where is the fun in that?! I mentioned the too-short rod to my mom and she happened to find a $50 rod on clearance for $15 at Lowes! I figured the project was dead in the water for a while as I didn’t know when I would be able to get the rod from New York. Cue my awesome lifelong friend Christine, who lives in Maine but just happened to be going home this past weekend for a visit. She swung by my moms for the rod and delivered it to me on her way back home. Yeah! Operation curtain hanging was back on! I wasn’t crazy about the finials at first but now that they are up I think they look pretty nice (also, beggars can’t be choosers). Side note: You can see that there are roller shades on the two outer windows and not the center window. That’s because our landlord is slowly replacing the original windows in our place and the new ones are shade-less. Ahhhh apartment living. We are stuck with the roller shades at that height as we currently have plastic on the windows to help keep the chill out. Also,don’t mind the baby stuff. I straightened up as much as I could. I keeps it real, ya know (too much?). Andre and I sprang into action with this project. We were eager to finally have something to block the chill on winter nights and keep the scorching sun off our necks in the morning. While Andre did all of the high work (I am only 5’1 after all), I assembled the curtain rod and removed the old holdbacks the previous renter had left. We made quick work of the project. Measuring everything off, drilling, and securing the brackets. Until we reached the middle. I’m not sure what was up with the wall right there, but the plaster just wasn’t holding up. We decided to move onto the left side and had the same issue. 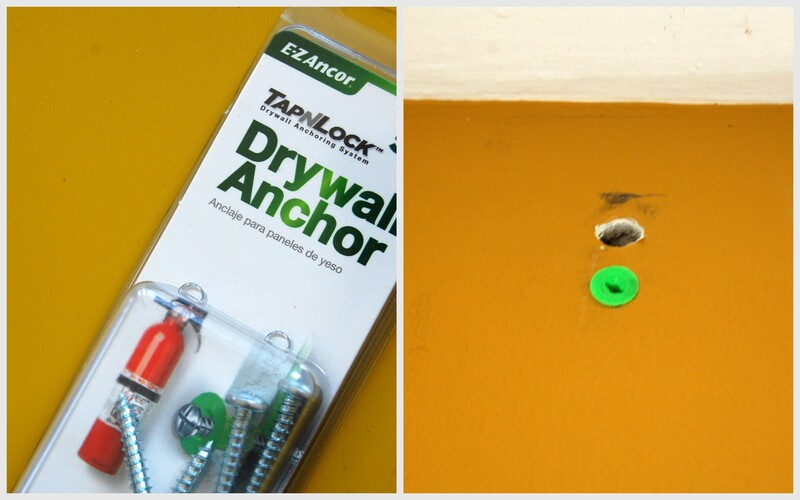 The anchors popped right through the holes we made, so I had a bright idea to use some anchors we had picked up for a different project. They popped right in and we secured the bracket. Then, the wall crumbled some more and the bracket gave way. So, we headed to Home Depot to get some bigger/stronger plaster anchors. We got what we needed and installed the left bracket a little bit further out from the gaping hole we made. The hole is covered by the curtains and we will patch it up when we paint. As for the center bracket, it’s holding its own, but is pulling away from the wall a tad. Not sure what we should do. If we move it to either side it will clearly be off center and my OCD Libra self just can’t handle that. Oh well, live and learn. Everything is up and looks great. 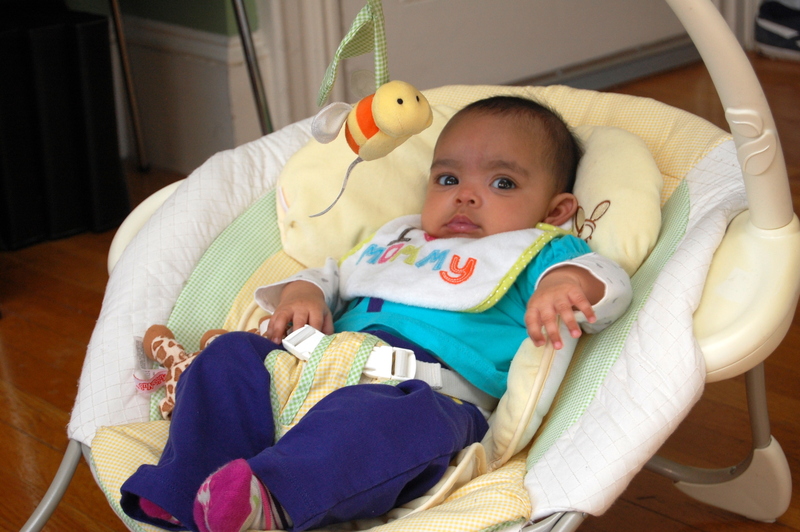 Again, don’t mind Eila on her playmat. She was playing quietly and I wasn’t going to the rock the boat. So, here’s what I’m thinking as I look at this picture. 3) These are only 3 of the 5 windows in our living room. The other two are on the wall to the left of these and I’ve yet to figure out a treatment solution for them. That is another project for another week. 4) I thought I was going to paint the walls a neutral/cream color, but now that the curtains are up, I’m not sure what to do (I do know one thing- the two-tone gold and green has got to go). 5) I really need to clean my windows once Spring is here and we take the plastic off. So, what say you? Any opinions/thoughts? Especially on the wall color. I’m horrible at choosing colors. I think from a time/money stand point, just paint the yellow wall. I think you’re ok with the green you have for now. I say change the yellow to a cream or light gray? I know, but this green is so muddy and yuck. Plus I hate that I sit in my green living room and look into my green kitchen. It may be my favorite color but even that is too much green for me. I will not say a word about paint since it took me seven years and a college tuition’s worth of paint sample pots. BUT! BABY! Soooo cute. 🙂 And great job on hanging the curtains. 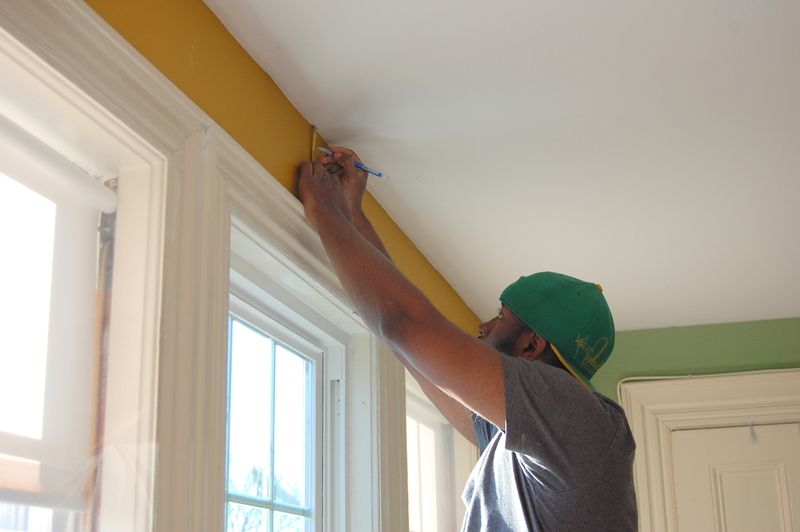 We have plaster walls…and the same problems you do when hanging anything. Oof. Plaster walls are the bane of my existence. Really, I cannot choose a paint color to save my life– so I’ll really be no help whatsoever–but I thought I would tell you that it was the photo of your gold wall on Jules blog that made me want to take a look. So bright and cheerful! Thanks Amy. The wall was that color when we moved in and I have just felt compelled to paint it. But maybe not? Just visiting from P&FF – Great job on the curtains. You could colour match the green, and just paint out all the walls in the same green – it looks like it is complimentary to the curtains and couch well enough(? )…I’m an all white walls kind of gal (and have learned to live with the fingerprints of youth pasted all over them) – so would probably go with a white the same as the trim, but eggshell, not gloss. I’ve been thinking of going white/cream in this room. We spend so much time in here, it’s always a busy space. Maybe simple white might be the best fit. Thanks! Personally, I am a fan of the neutral wall with color added by accessories – like your cute yellow table & pillows. I feel your joy/ pain with the curtain rod. 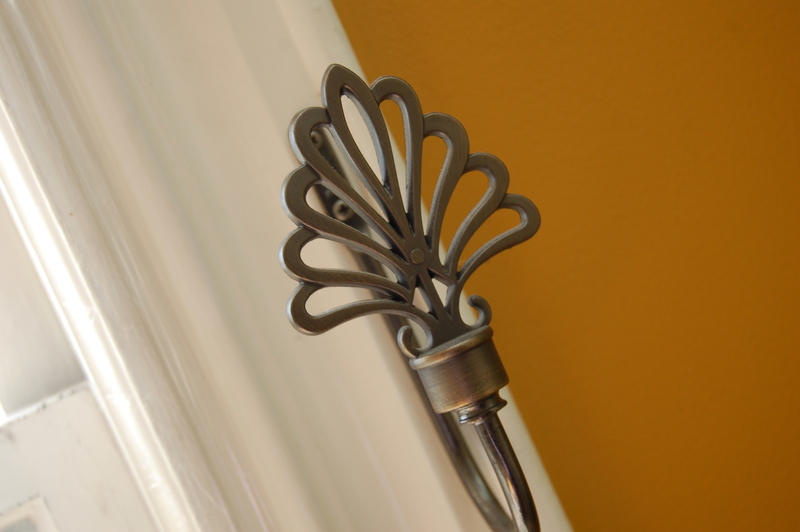 We just hung a long curtain rod in our family room, and suddenly it’s popping out due to a naughty 4 year old who mistook it for a swing….. so I’ll be heading to the hardware store for heavy duty anchors this weekend. Hopefully they have some that will work & not force us to redrill on either side (which would drive me even more bananas than having no curtains at all). Thats what I was thinking. 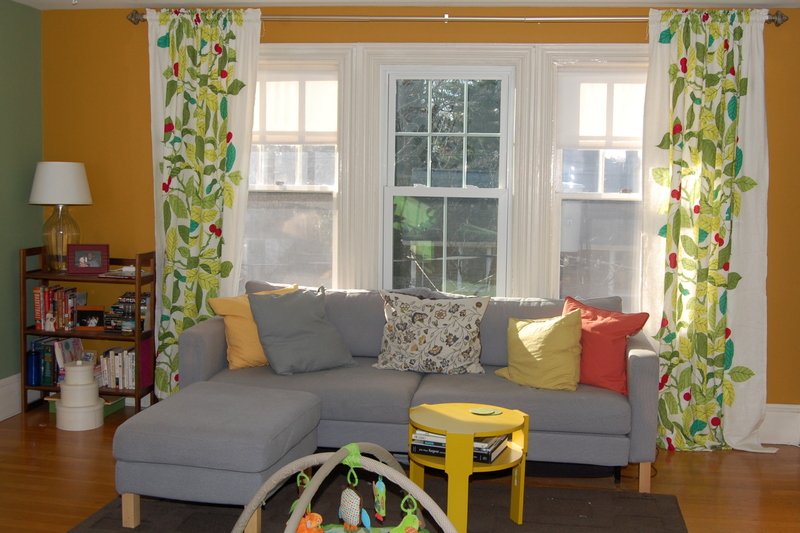 Busy patterned curtains, yellow table, colorful pillows… I should keep the walls simple. You guys are so helpful! I thought the green on the left wall looked nice with the curtains. If you aren’t sick of it, you could just bring it around on all walls. It looks like it goes with the darker green leaf. The other thought I had was to go with the lighter green in the drape. We renovated a Queen Anne…plaster everywhere. Spent 11 yrs working on it and never did get brave enough to hang anything in the plaster! Eleven years?! Wow! I bet that was quite the experience! Anyway! Good job getting the curtains up! I would suggest you add a simple hem that doesn’t cut off the extra length so you can just pull the stitches if you move to a place with higher ceilings. As for the paint color, I see you’re on board with a good neutral. 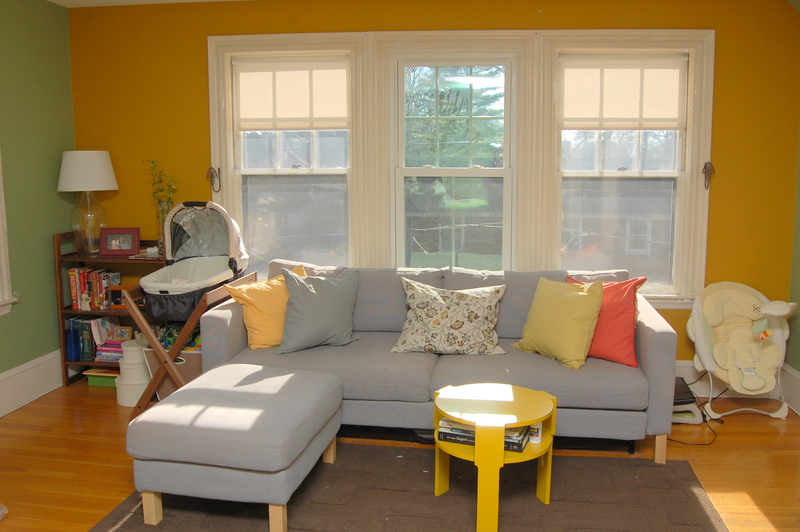 I’d go with a paaaaaale oatmeal/taupe or a color about 3 shades lighter than the yellow leaf on the curtains. White is good, but I’m always more keen on a nice soft shade than a stark white unless you have plans to put lots of art on the walls. Thanks! Such helpful paint advice too. We just bought a much lighter rug, so I definitely cant go with a white. A pale oatmeal sounds like a good possibility. I’ll have to start looking through paint sample cards! Haha, I like the way YOUR place is decorated! And I’ll work on the whole vacating an apartment thing. Except maybe the first floor. We love our second floor neighbors. Then this would be a house of awesomeness.